On the evening of Friday, December 16, 1853, local leaders in Yellow Hook met at the local schoolhouse to discuss changing the name of the village. I don’t know if any other ideas were floated besides the one that stuck: Bay Ridge. 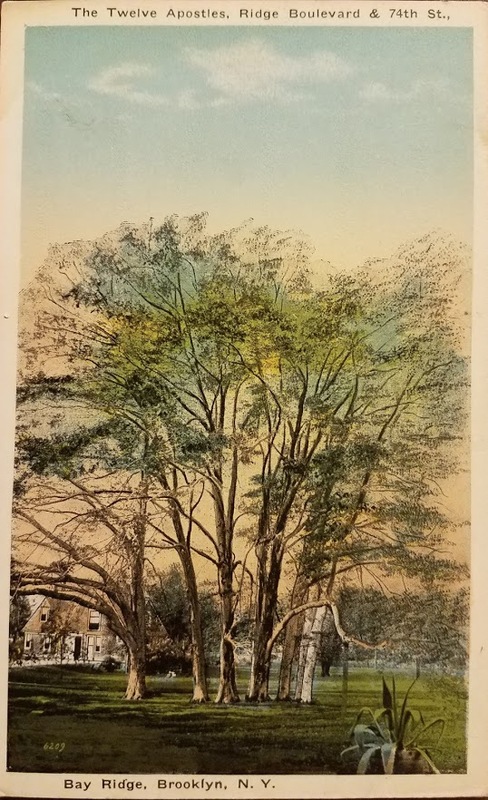 Suggested by local florist James Weir, it acknowledged the area’s most attractive geographic features: New York Bay, which the village bordered, and the ridge from which said waterway was gloriously visible. A ridge, by definition, is “a long narrow hilltop.” A topographical map of the neighborhood from the late 19th century shows that the area closer to the shoreline, with a few small exceptions, is about 20 or 30 feet above sea level, while the area from about 73rd Street and Third Avenue to 85th Street and Ridge Boulevard hits elevations of 70, 80, almost 100 feet. Of course, it’s not even—the ridge rises and dips as it violates the modern street grid. Such elevations once gave Bay Ridge majestic, sweeping views that have been lost to development; you can stand on 74th Street, near Third Avenue, looking toward the water, and get a slight sense of how high up you are—but apartment buildings block the panoramic view. You can see the Fort Hamilton High School tower poking up from the horizon from 84th and Third, but can’t get a sense of the space around it. You can walk down to Shore Road and get a sense of the Bay, but it’s harder these days to comprehend the Ridge—at least when you’re not walking uphill. 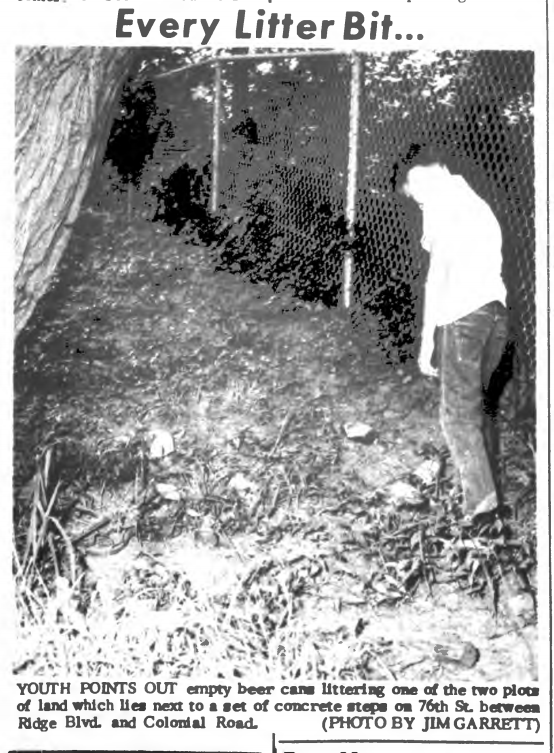 Between 73rd and 76th streets, Ridge Boulevard and Colonial Road, the ridge was (and is) more of a bluff, with a steep drop of almost twenty feet. 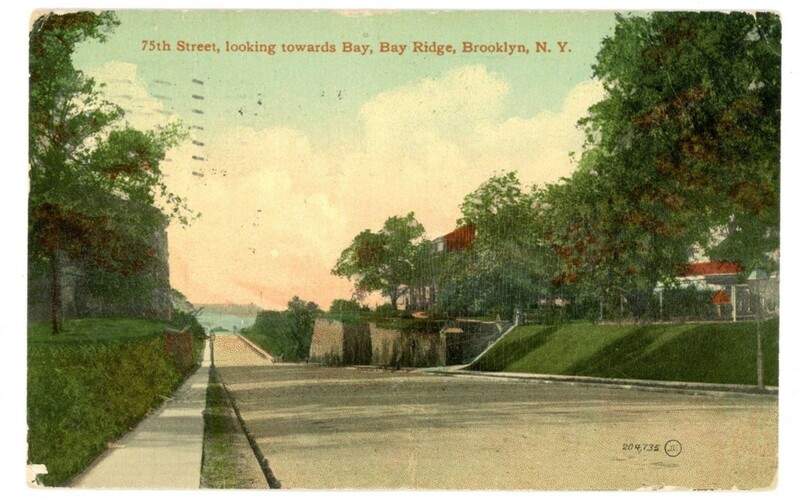 “This hill marks the terminal moraine for the East Coast and the southernmost deposit of land pushed ahead of the glacial ice caps that had covered much of North American during the Ice Age, before that ice finally began to melt and recede,” Peter Scarpa, Lawrence Stelter and Peter Syrdahl write in Images of America: Bay Ridge. That is, geologists believe Long Island (of which, remember, Brooklyn is the westernmost part) was created ca. 19,000 BCE by glaciers that melted, depositing the rock and other debris they’d acquired as they moved, producing land. The Bay Ridge area would have been formed by the edge of one such glacier, and our ridge would have been where it dumped the last of its debris, forming a high point. Engineers were able to build a proper street down 75th Street (now Bay Ridge Parkway) around the turn of the 20th century; if I had to guess, it was by building it double wide, allowing the descent to be more gradual—the angle of the grade less severe—by digging deep into the hill; photographs of 75th Street from the late 19th and early 20th centuries, after the street had been properly cut, show houses alongside it rising high above it, on natural hills later eliminated by the construction of apartment houses and modern condos. But for the surrounding, nonmajor thoroughfares—74th and 76th streets—it wasn’t feasible to do the same. “There is a steep drop,” the Eagle reported in 1931, “making motor and pedestrian traffic impossible.” And so, for a surprisingly long time, the roads just dead ended at a cliff, which must have been a magnificent lookout, high above the streets below—which is why people chose to build a few spectacular mansions here, some of which still survive and give us a glimpse of Old Bay Ridge’s architectural and geological glory. 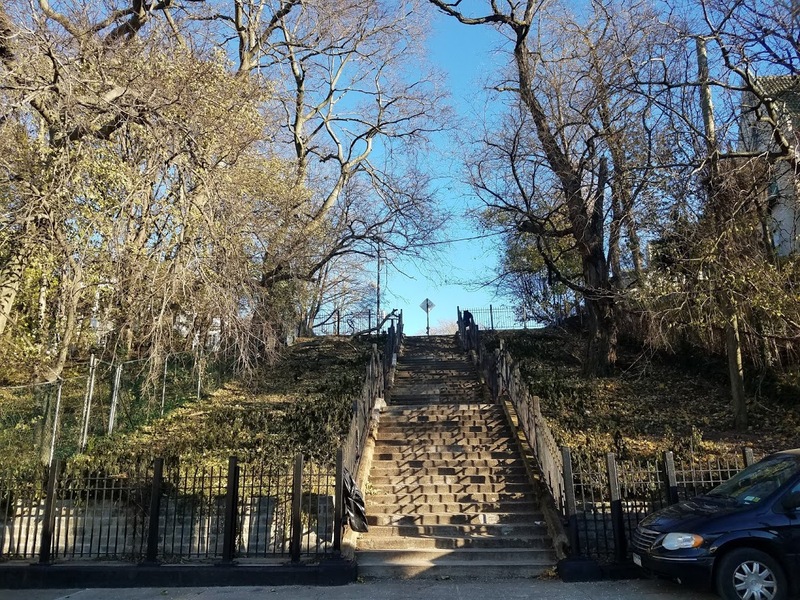 The idea of sticking a stone staircase in the middle of 76th Street is at least as old as 1909. 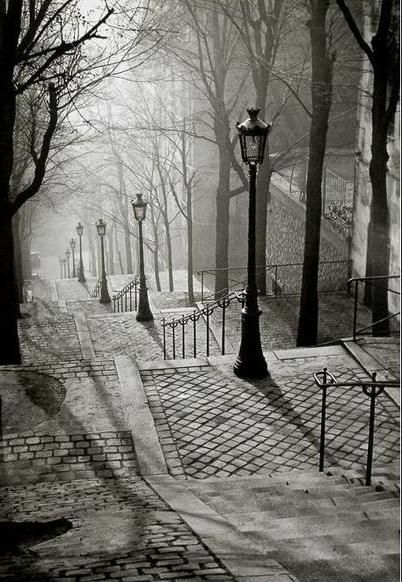 “Step streets” are not unusual in hilly municipal areas; they’re all over upper Manhattan and the Riverdale section of the Bronx; the most iconic step streets in the world cut through the steep hills of the Montmartre section of Paris. 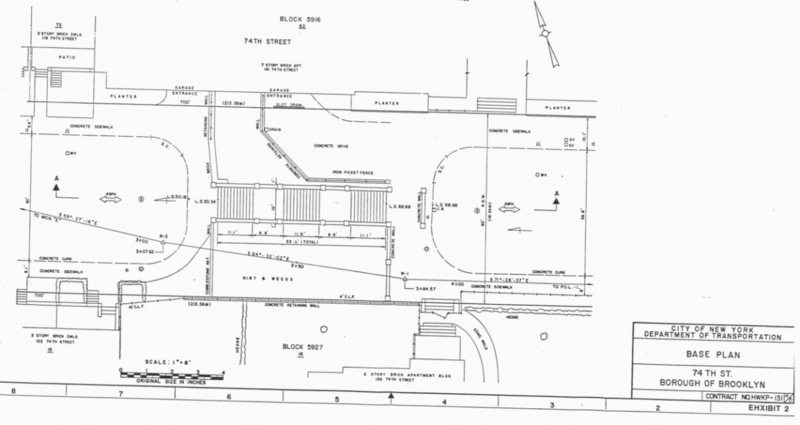 In 1909, the “Chief Engineer of Highways Bureau recommend[ed], in view of [the] steep incline on that portion of Seventy-sixth street…that a re-enforced concrete stairway, 10 feet in width, with the necessary appurtenances, be constructed in the center of the street, and that the remaining spaces be sodded,” the Brooklyn Eagle reported. A resolution was passed in 1910, amended in 1912, passed again in 1913, and so on. But no actual work seems to have begun until at least October 1922, when a request for bids for the job appeared in the Eagle, giving contractors 60 working days to excavate 381 cubic yards of soil, build 50 feet of cement curb, 910 square feet of cement sidewalks with cinder or gravel foundations, as well as put in 250 square yards of sod—and build the stairway, and maintain it for a year. We know that the stairway was finished by 1924, if not a little sooner, because it appears on an aerial photo from that year. 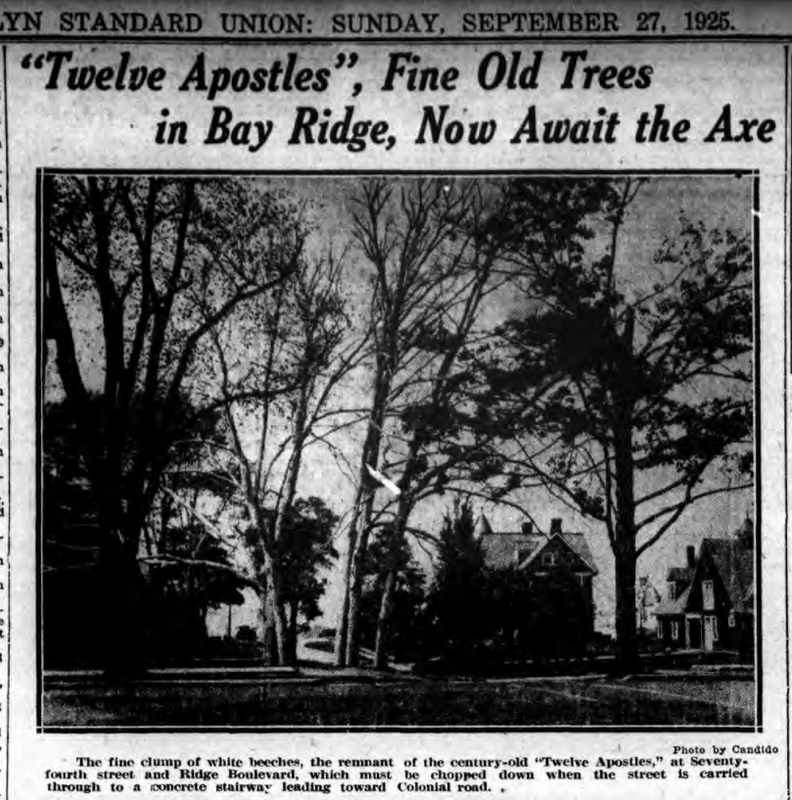 This was relatively late in the history of modern Bay Ridge. The Fourth Avenue subway had opened as far as 86th Street in 1916, expectation of which had kicked off the real estate speculation and development that had been raging since the turn of the century. People were commuting to Manhattan by subway, returning at night to their brick or limestone rowhouses in this far-flung section of Brooklyn. Surely, it was hardly acceptable for a street to just dead-end at a scenic cliff. 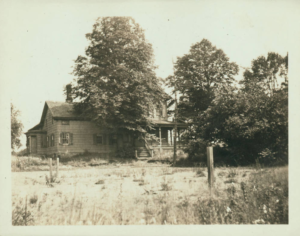 Though the neighborhood would have been substantially less developed than today, by the 1920s it was no longer the rural countryside it had recently been: urbanization had begun. Then again, it had yet to finish. 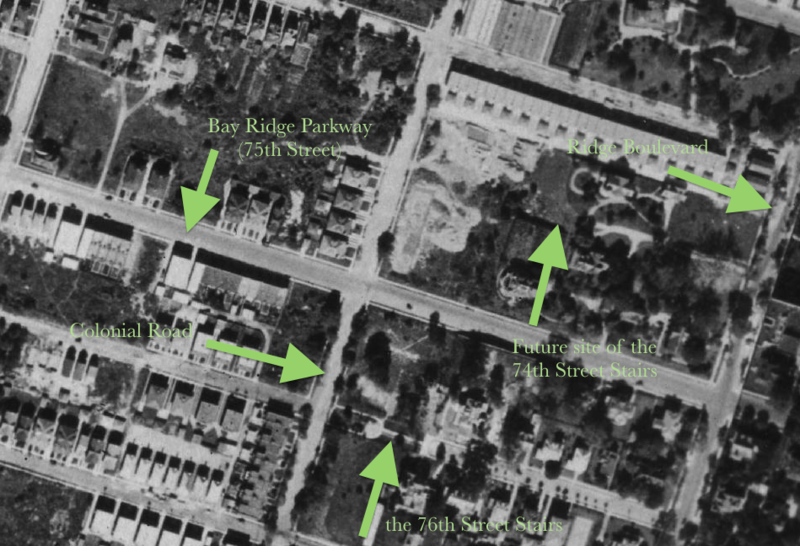 By September 1925, the area didn’t even have a 74th Street, at least not between Ridge Boulevard and Narrows Avenue—just the occasional foot trail or winding drive breaking up half-developed fields. 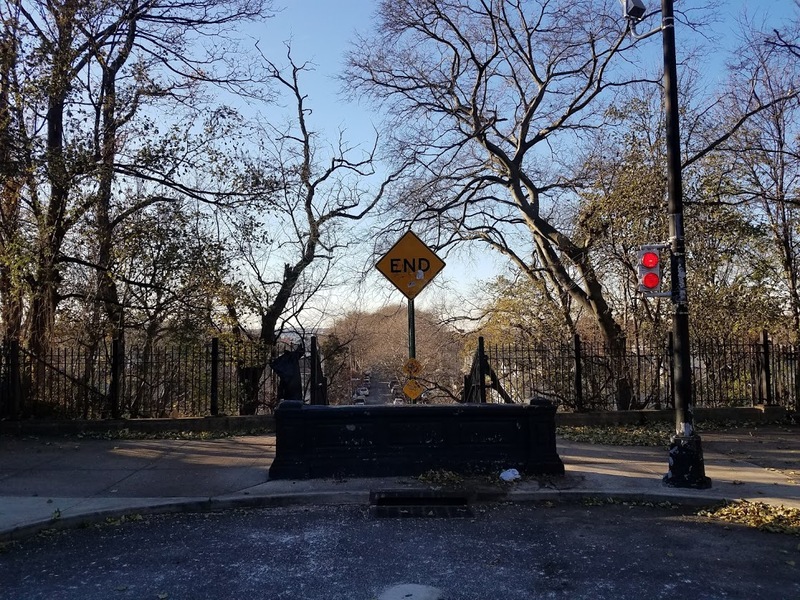 But a petition was filed that month, to cut and pave 74th Street, as well as to construct a stairway—the first mention I could find of the step street on that block. “The present proposal…calls for a thoroughfare similar to that of Seventy-sixth street,” the Brooklyn Standard Union reported a week later. The street will not be opened for through vehicle traffic. The elevation between Ridge boulevard and Colonial road is some forty feet difference [probably actually more like 20—Ed. ], and to accommodate pedestrian traffic, a series of concrete steps will be constructed, about midway between the two thoroughfares. Vehicle traffic desiring to reach Colonial road, and avenues beyond, will be compelled to use either Seventy-third or Seventy-fifth street, which have been graded and paved for that purpose. There was a time when every person of the district knew the trees and their history. As time wore on, one by one, the trees died off. Some struck by lightning and others blown over by high gales, which swept in from the upper bay. Sentimentalists about the district did all that was humanly possible to save this group, in the days gone by, when their destruction seemed imminent. 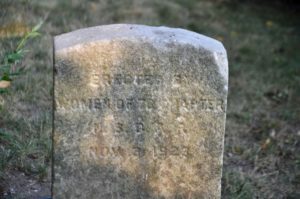 Congressman William E. Cleary…remembers [them]. Many a night, for the past twenty-five years, he has wandered his way along the Ridge boulevard…and cast his eyes at the group of trees with their white branches standing out in the darkness of the night, and admired the picture. The trees are frequently mentioned in histories of the neighborhood; they were beloved. When the community considered renaming Second Avenue, in 1908, the first idea pitched was Beechwood Avenue, likely in honor of this clump of trees that the avenue passed. The following year, however, local leaders settled instead on “Ridge Boulevard,” after the geological feature that gave the neighborhood its name. Sure enough, 74th Street was cut through, and the trees were cut down. Like the stairs on 76th Street, those on 74th Street weren’t built immediately. A resolution finally passed in 1930, followed by a call for bids, which expected the work to be completed within 40 consecutive working days. 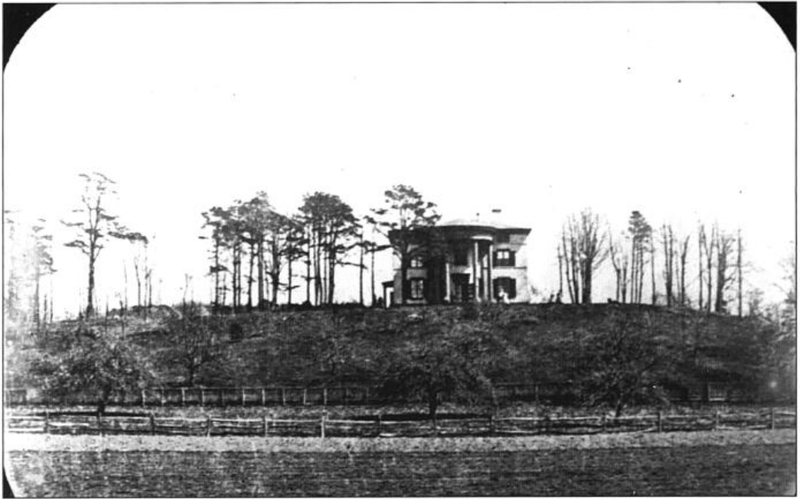 Around this time, two houses were built at the peak of the ridge on 74th Street, replacing two mansions there that been built on George Fletcher’s estate, a one-time bank teller whose son tried to have him declared insane in the 1870s, in order to take control of the land (if local gossip were to be believed). 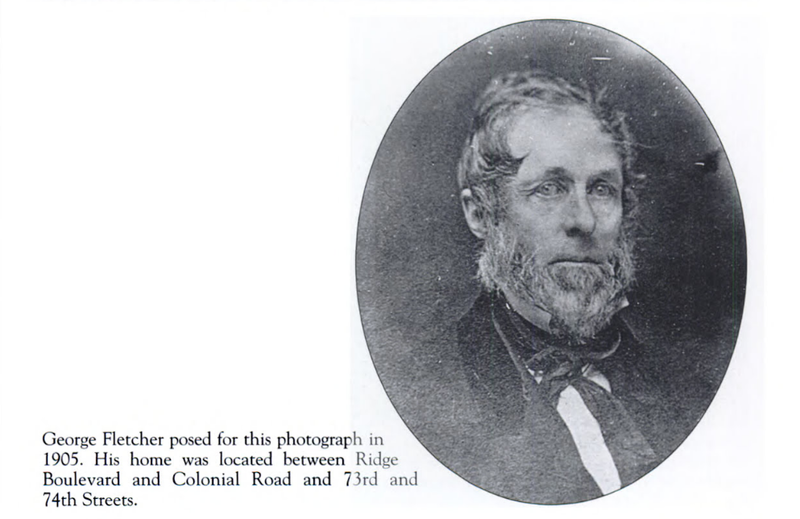 Fletcher was one of the early, nonfarmer settlers to Bay Ridge (along with men like Joseph Perry, Henry Murphy and Theodore Sedgwick), likely arriving in the community around the 1850s; his old house, on the north side of 74th Street, was among the oldest in the area. But his old house, plus the newer one on the south side of 74th Street, presumably built by his son, were torn down—both in 1930, according to department of building records. 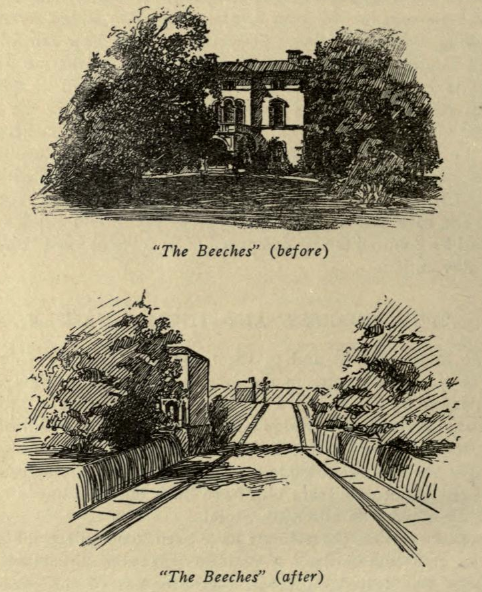 The original Fletcher mansion was replaced by several more modest homes, including the mock Tudor brick houses still in the middle of the block, as well as an oddly shaped home at the edge of the bluff. 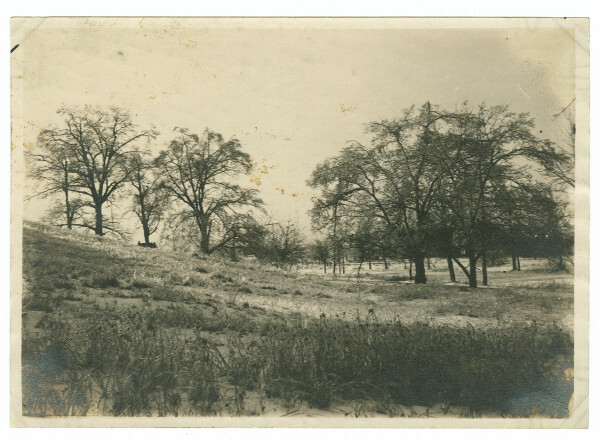 A tax photo from 1939, at the foot of the bluff, shows children with sleds, suggesting that the hill here was used by local youths after snow storms. 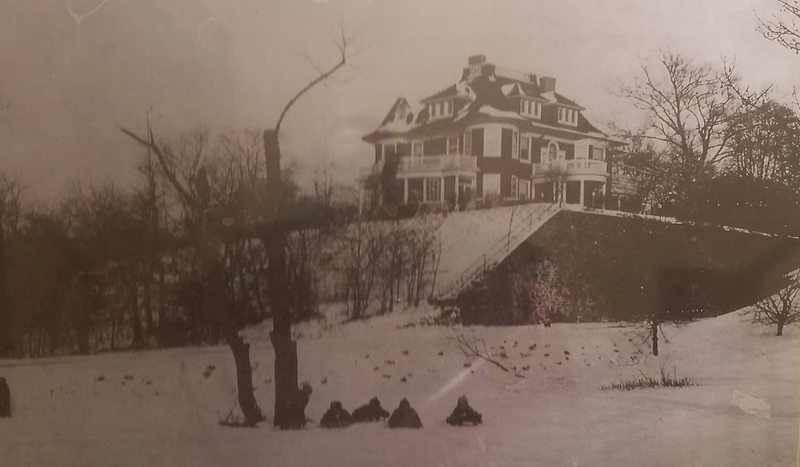 Another photo, of the northeast corner of 75th Street and Colonial Road (this one undated), also shows children sledding down the hill there. 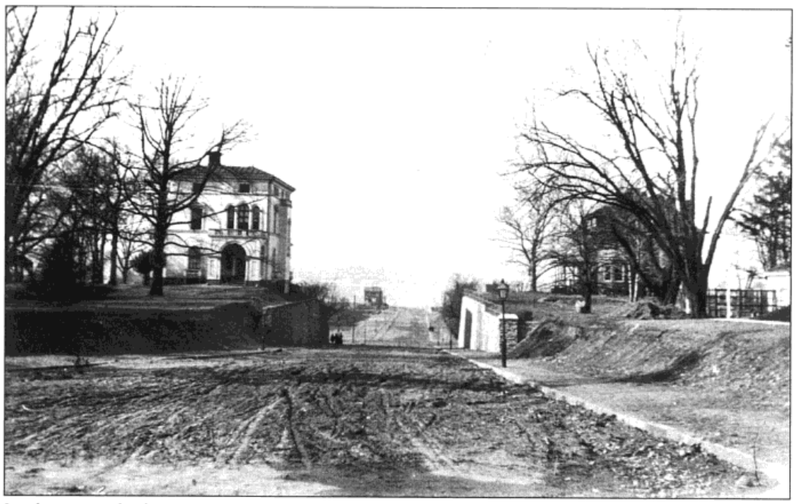 About Colonial Road, looking north east at a house on 75th Street, I think! Possibly the Schultheis house. Late 19th or early 20th century. From a wall along the staircase to the second floor at Foodtown! But the ugly house and its in-tact, sleddable hillside were replaced in the late 1950s by the apartment building that’s still there. (The department of buildings issued its certificate of occupancy in 1957, and advertisements began appearing in the New York Post in 1958.) 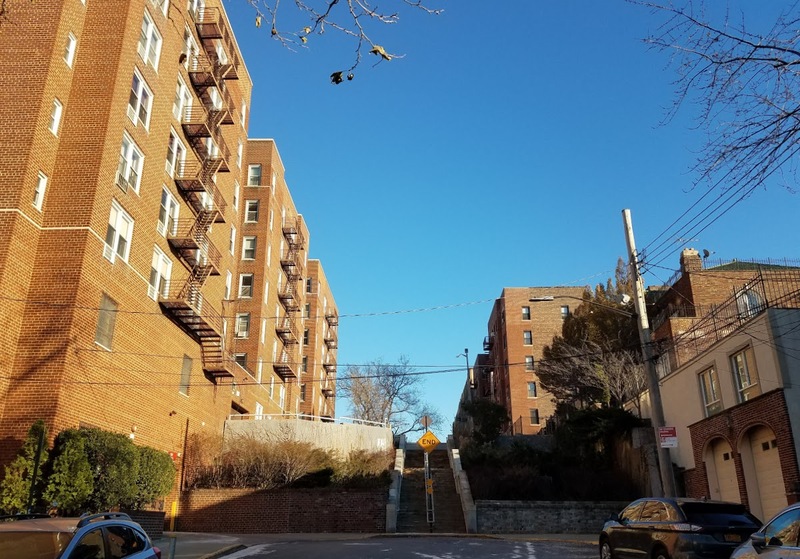 Few Bay Ridge apartment houses are taller than six floors; at the top of the stairs, 121–143 74th Street is also six floors—but from the bottom, it’s eight! Making it unusually tall for the area, from at least one vantage point. The house across the street, 130 74th Street, which replaced the Fletcher fils house, was also built around 1930, according to department of buildings records. It’s perhaps not as grand as corresponding homes on the 76th Street bluff, but it’s not insubstantial—the owners, for example, pay property taxes for the adjoining 45’x75’ tennis court that no one ever seems to play on. That court seems to be relatively new, constructed in 1996, according to complaints filed with the DOB at that time, as well as an aerial photograph. It seems the owners also took inspiration from the apartment building across the street at this time and built their garage, which is built into the bluff, extending from the top of the stairs to the bottom. Today, the 74th Street stairs are hideous. The stainless steel bannister that runs down the middle is an eyesore, and they feel hemmed in on either side by suffocating structures. 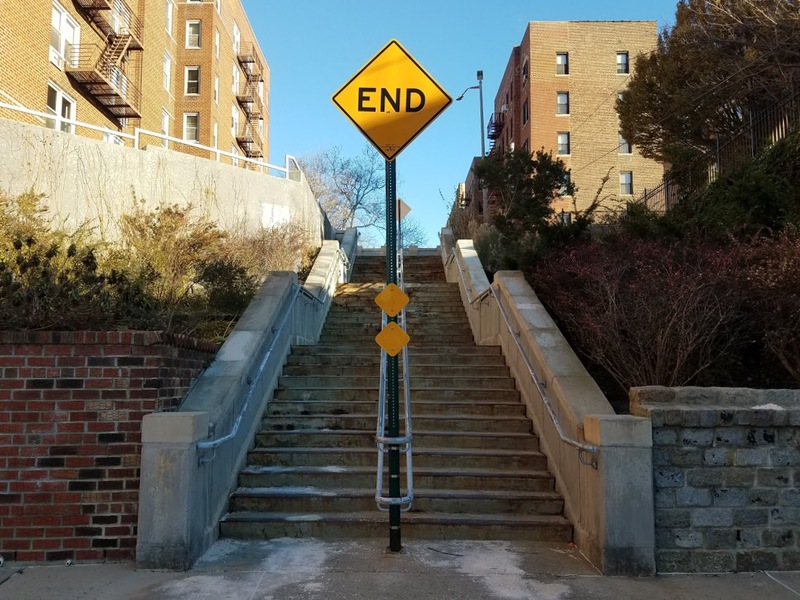 These stairs aren’t a romantic relic of early Bay Ridge; they’re a miserable reminder of thoughtless, midcentury, automobile-inspired development. DEFINITELY NOT “the stairway to paradise[. ]” [R]esidents point out the dangerous and decrepit condition of the 74th St. steps leading from Colonial Rd. to Ridge Blvd. Broken treds [sic] and crumbling cement lead to [a] high percentage of serious accidents. Litterbugs who traverse the area are constantly tossing cans, containers and other garbage in to the area. If the steps were repaired, the work didn’t last. By the 1980s, locals and their elected officials were again sounding alarms. 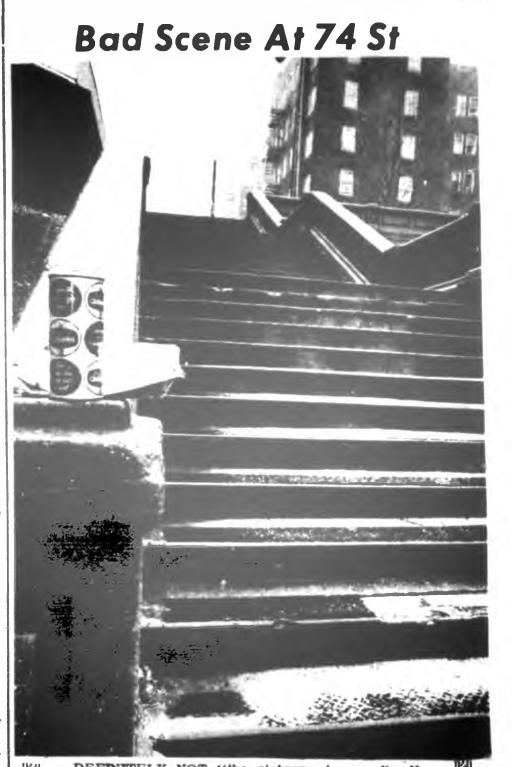 “The condition of these steps has rapidly deteriorated in the past few months [and] may now pose a very serious potential hazard to the nearby residents as well as the pedestrians who may use this roadway,” State Senator Christopher Mega wrote to the local community board in 1989. 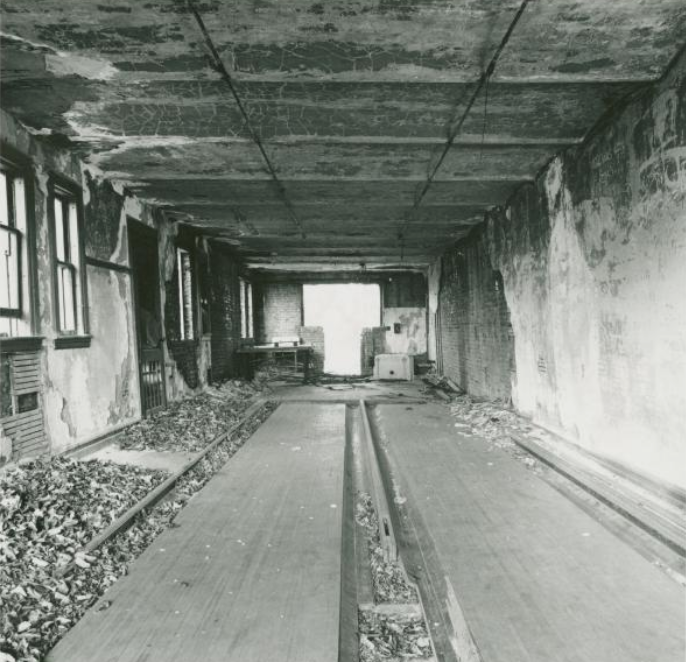 Residents of the apartment building had been complaining since at least 1986 about the “appalling condition” of the stairs, and the community board had been working with the department of transportation to fund their repair. The community-board records I was given don’t indicate if repairs were made; perhaps something superficial, because the stairs were substantially overhauled at the turn of the century—including the “reconstruction of existing concrete walls, parapets, steps, landings, rubble retaining wall, curbs, sidewalks and landscaping.” Assemblymember Dugan died in office, in 1996; she was replaced in a special election by Assemblymember Joan Millman the following year. 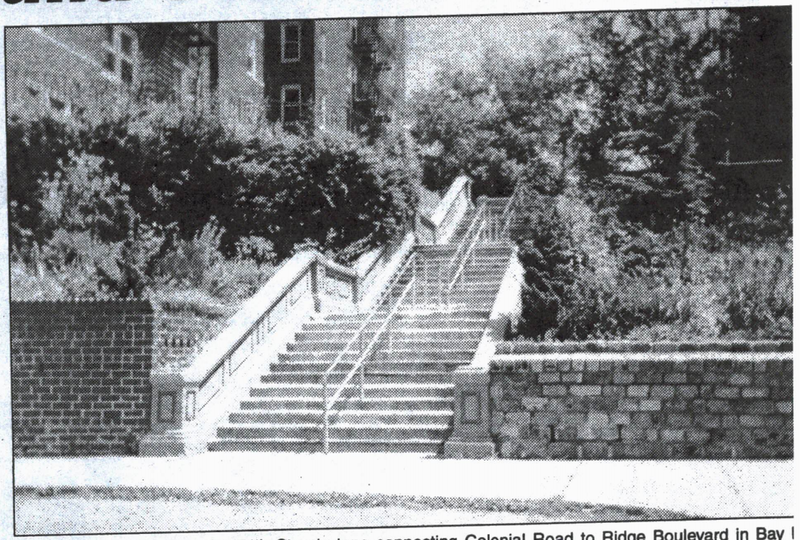 “Getting the 74th Street steps repaired was one of her first priorities,” the Brooklyn Paper reported in October 2000. It took four years, but she and then-Councilmember Vincent Gentile secured matching funds from state and city to get it done. “They told me they couldn’t just repair steps,” Millman said. “They said they would have to rebuild them,” which involved delicate work with sewer and water mains. During construction in 2001 (it would be over by early 2002), nearby residents were warned that the garden on the north side of the stairs would be dug up, and so they moved some mature plants there to the rear of No. 130. But contractors then also dug up the south garden, most notably destroying a mature birch tree near the top of the stairs. A group calling itself the Miracle on 74th Street began fundraising ca. 2001 to maintain the garden space. 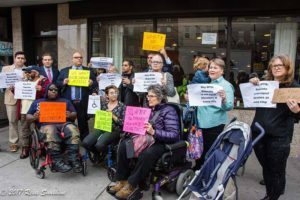 “Impressed with the degree of cooperation the group managed to get from a variety of city agencies, [then-Public Advocate Mark Green] promised to match, out of his own pocket, any money up to $500 that the group was able to raise,” the Brooklyn Paper reported. Next time the group saw Green, they’d raised $800, and he cut the group a $500 check on the spot. Green quickly added that he would not be able to financially support every group of citizens that accomplished something for their neighborhood, but he would like to see a city grand program set up that could reward such people. Of course, 9/11 happened, Bloomberg became mayor, and Mark Green faded into local historical obscurity. The garden beside the steps, however, remains in pretty good shape. The original Thomas house appears very similar to the house (131 76th Street) now standing on the north side of the 76th Street stairs, about 350 or 400 feet north of the original Thomas house’s location. I have a sneaking suspicion (which I can’t prove) that the house was picked up and moved to its present site ca. 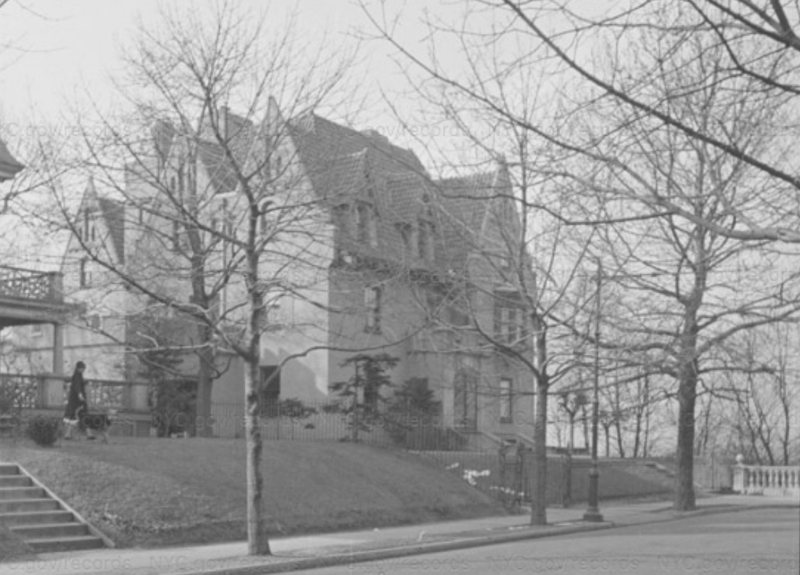 1911, when it was also expanded with a substantial addition on its south side—the side that today faces 76th Street. It’s also possible, however, that the Thomas house was demolished and a similar but different house was built nearby around the same time. But while the Thomas or Thomasesque house at No. 131 is to this day elegantly imposing, regally puffing out its chest like a raptor from its perch atop the ridge, it’s overshadowed by its neighbor across 76th Street, 122 76th Street—aka the Andrews house. 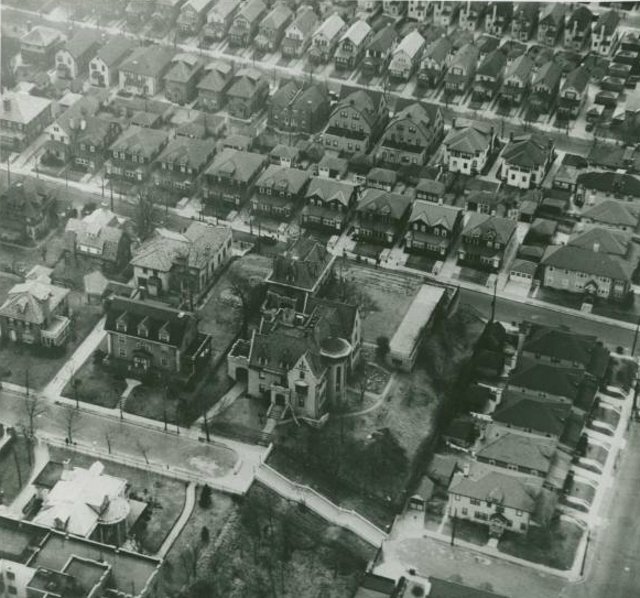 Looking northeast, from about 77th Street, at the future site of the 76th Street stairs (center) and the houses that still flank them, 1913. 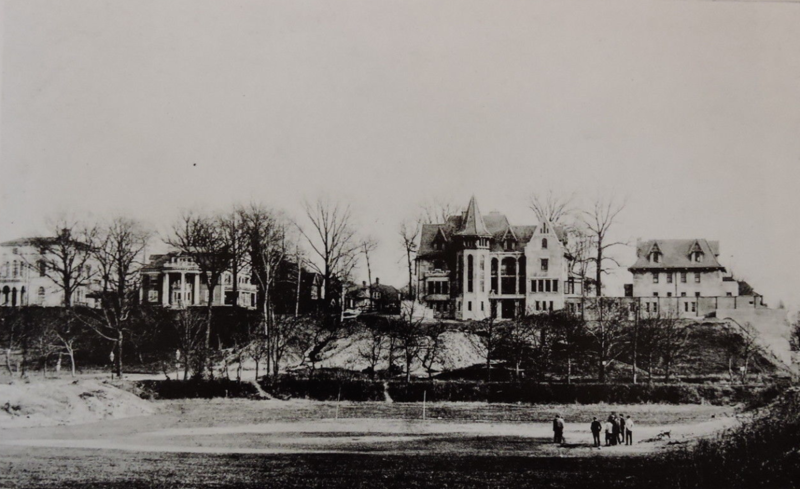 Thomasesque house, center left; Andrews house, center right—then just one year old. Colonial Road running from left to right in the middle ground. From the author’s collection. The Andrews house doesn’t look like much from the top of the 76th Street stairs, but that’s not how it’s meant to be looked at—it’s meant to be looked at from below, a view today obscured by tree growth and house construction. But when it was built in 1912, it would have seemed literally to tower over the surrounding area, like a king’s castle above a medieval village, visibly overwhelming. 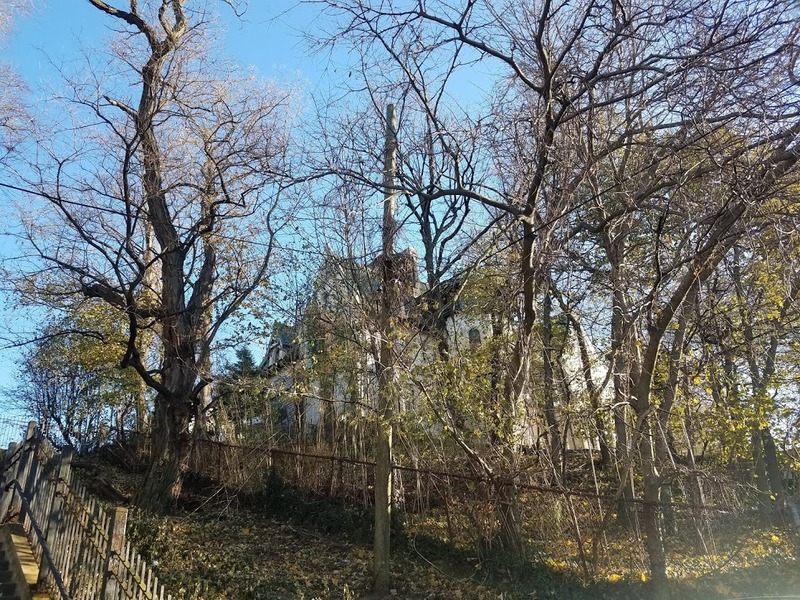 Sometimes, in the winter, when the leaves have left the trees, you can still glimpse the old house from Colonial Road, and it’s breathtaking, almost phantasmagorical—the neogothic ghost of some majestic, manoric past, hovering in the air. Andrews was a partner in Humbert & Andrews, a manufacturer of preserves, though he also dealt in real estate. 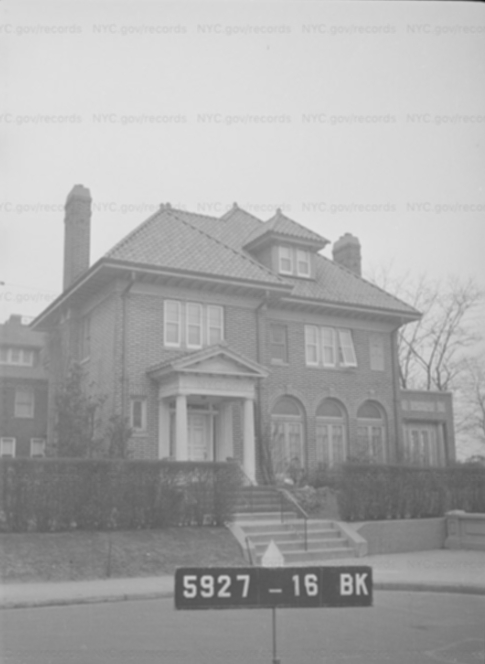 In 1922, he used his iconic house on 76th Street as partial payment for an apartment house in Clinton Hill, at 430 Clinton Avenue. 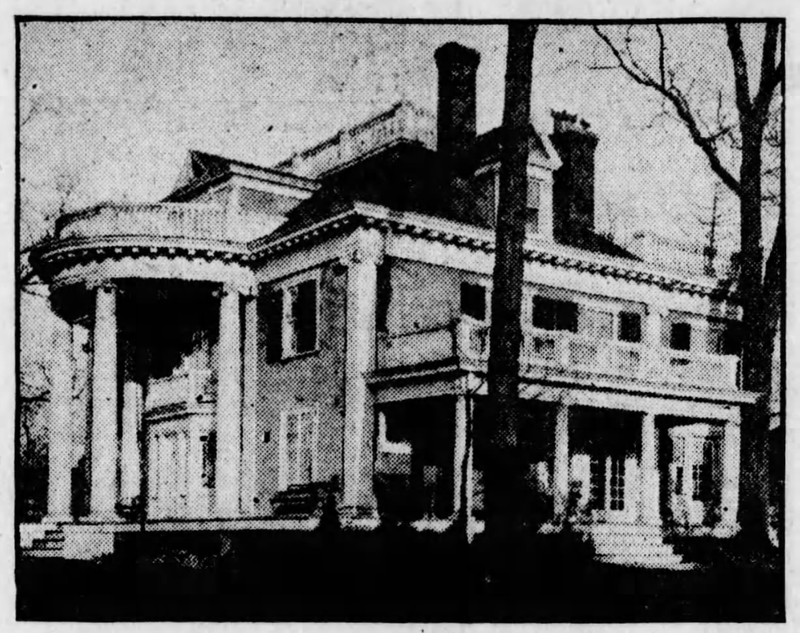 Not wanting to move out of Bay Ridge, Andrews bought the Thomas or Thomasesque house across the street, which at the time belonged to Charles S. Warbasse, Republican leader of the Ninth Assembly District. 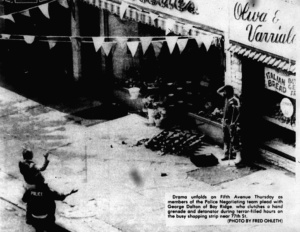 (A corresponding Democratic clubhouse in the same district was the building that later became conservative, former State Senator Marty Golden’s family business, the Bay Ridge Manor.) 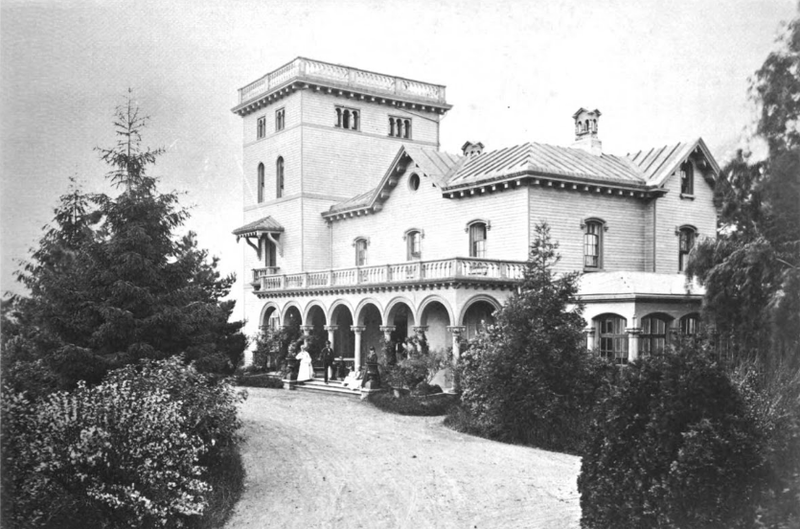 The Warbasse family had owned the house since at least 1911. Andrews planned to move the Thomas–Warbasse house back from the cliff, turn it around so it’s once bluff-fronting façade faced 76th Street, and build a new house in the old space. But it doesn’t seem that that ever happened. But not because Andrews couldn’t afford to! He acquired other properties around Brooklyn, including briefly buying back his original house, bundling them into a portfolio that he then used to acquire three 12-story office buildings in Manhattan, near 42nd Street and Fifth Avenue—at that time one of the largest Brooklyn real estate transactions ever, as the industry boomed in the years following expansion of the subways into many once-inaccessible corners of the borough, involving approximately $8 million in property [or more than $120 million, adjusted for inflation]. 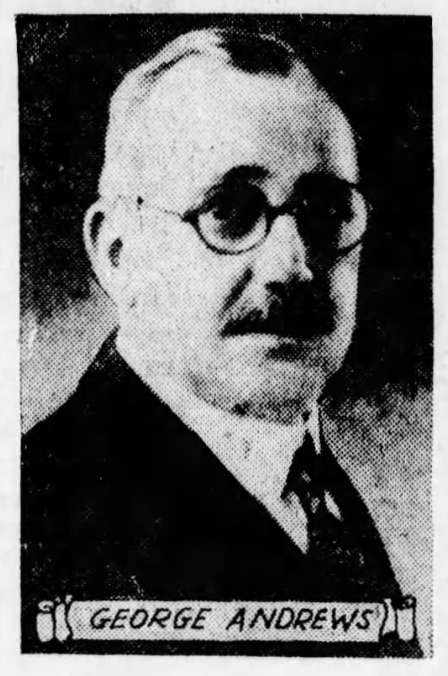 After this great success in his field, Andrews largely disappears from the newspaper record, making occasional cameos in items such as listings of Rotary Club members. 122 76th Street was sold in June 1924 to Dr. Frederic E. Elliott, an X-ray specialist who planned to use the ground floor as an office. “The large music room he has offered to the Bay Ridge Medical Society in which to hold their meetings and have as their headquarters and permanent library,” the Eagle reported. He was still there in 1930, when he began testing whether doctors could detect cancer before it became malignant by X-raying blood. And in 1944, when Dr. and Mrs. Elliott’s daughter, Elinor, married John Edward Koechley of San Francisco. John and Elinor remained in the house until at least 1978–79, when Dinanda Nooney photographed them, their children and their home, as part of a series documenting the inhabitants and interiors of approximately 200 Brooklyn homes. 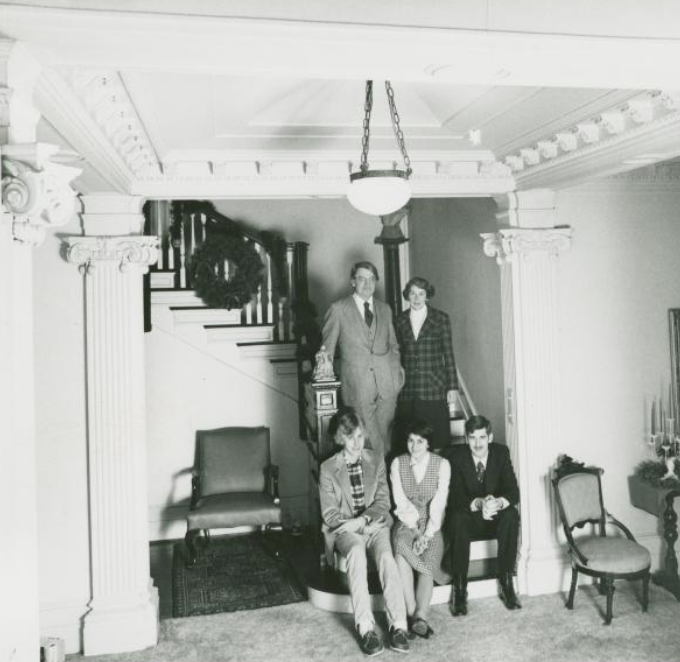 Elinor Koechley co-owned the Andrews mansion until she (and possibly her…nephew?) 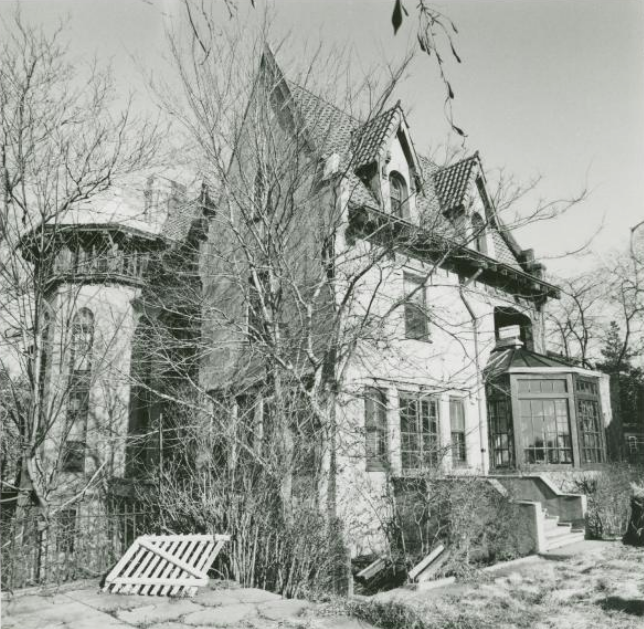 sold it in June 1986, though she had moved to New Rochelle at that point (which perhaps confirms rumors that the house had been vacant for some time in the 80s). The buyers were Alessandro and Irene Pirozzi, who spent what appears to have been $675,000—or $1.55 million, adjusted for inflation, less than half of what it had been worth in 1923. The Pirozzis still own the house (though just a matter of weeks ago they moved it into trust, which as I understand is not an unusual legal maneuver, for a variety of possible reasons)—meaning that in the more than 100 years since it was built, the Andrews mansion has been owned by just three families (not counting Andrews’s real estate flipping in the mid 1920s). 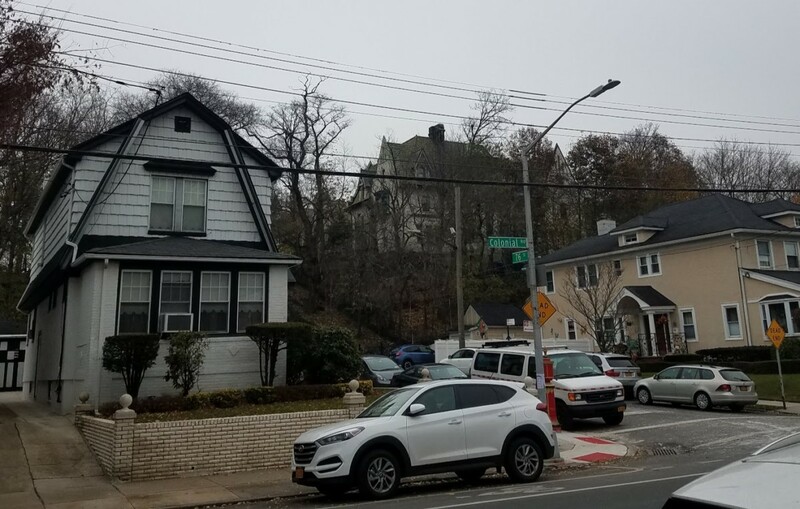 Unlike the 74th Street stairs, those on 76th Street have preserved a tiny pocket of a truly prelapsarian sense of old Bay Ridge—thickets of trees on sylvan slopes, topped with impressive, now-incongruous mansions, without any garish apartment complexes or parking garages. (The Andrews house does have a long garage, but it’s mostly hidden from view.) Much of the reason is that they haven’t received the same sort of renovational attention as the stairs on 74th Street. In fact, they’re in much need of repair, appearing near the top of the local community board’s annual list of necessary capital projects. Recently, one of the retaining walls at the base partially collapsed, though it appears to have been patched up. 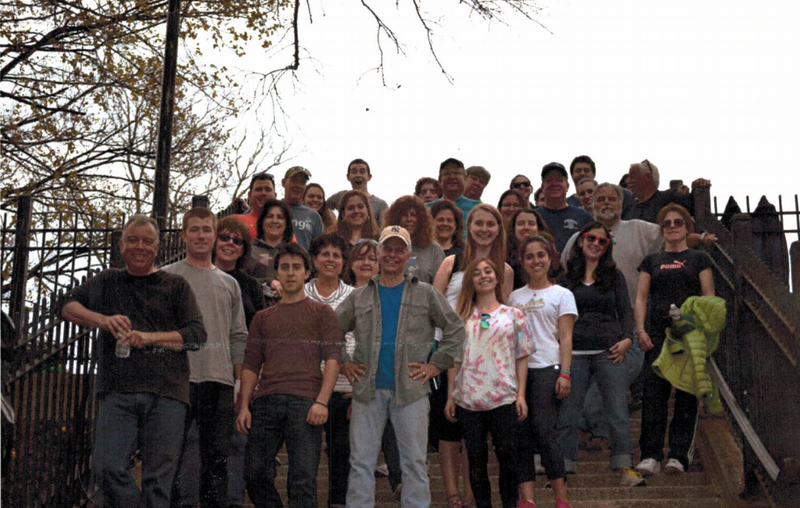 The open spaces around the stairs were cleaned up and given new plantings in 2014 by a local group of volunteers, in honor of Ryan Farrell Halliday, a local young man who had died that year, five years after a diagnosis of acute lymphoblastic leukemia. They have cleaned, trimmed, planted and painted with the goal of beautifying this step street location and making it safer. 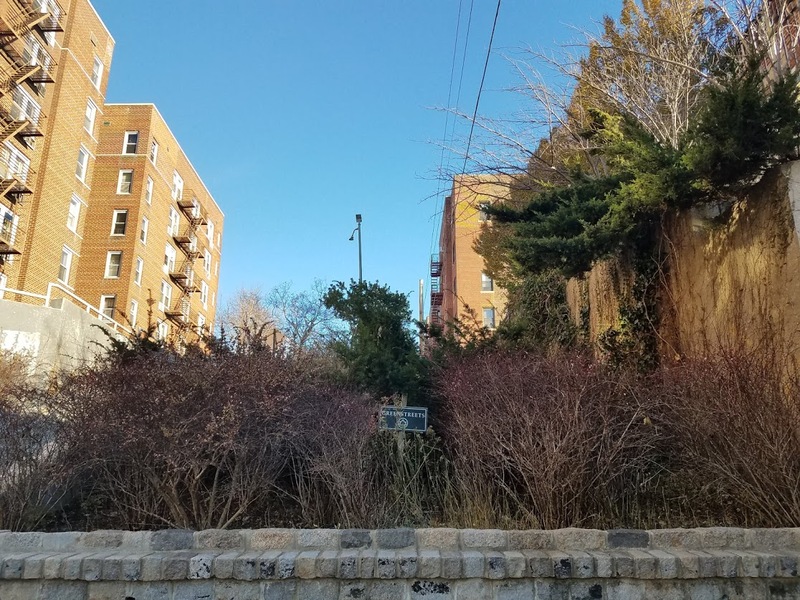 This was a daunting task, and the group has requested that the location be added as a Greenstreets location [like 74th Street] so that it will continue to be maintained and will receive further beautification and attention. 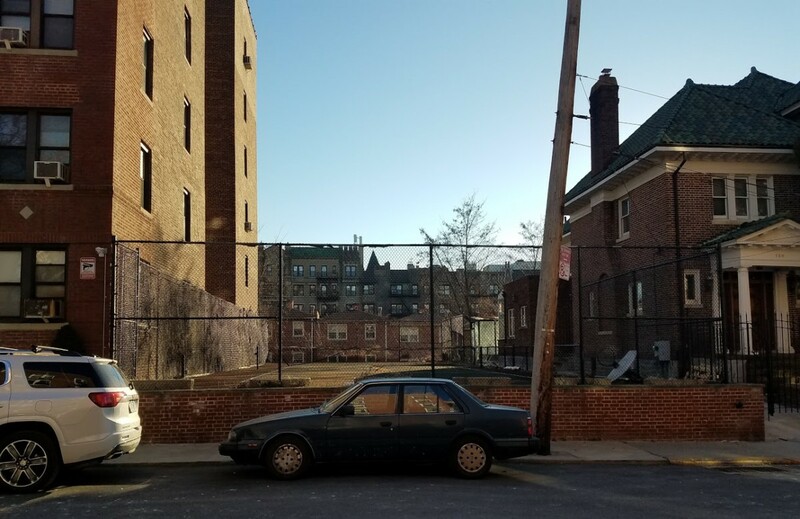 “Some steps have begun to crumble, creating a hazardous sitation for the many [people] who use the staircase during their commutes, for exercise, or simply to travel through the neighborhood,” read the letter. It has also been reported that a portion of the railing is now missing, further increasing the risk of injury on the staircase…We also request you to consider an increase in lighting in the area, as the darkness has created a haven for drinking, graffiti, and drug use. Proper illumination will increase safety during evening hours, put nearby residents at ease, and limit the need for cleaning beer bottles, drug paraphernalia, and graffiti by local volunteers. Indeed, when I was a teenager at the turn of the millennium, the stairs were a regular hangout for local youths. In fact, as far back as 1964, “76 St. Residents Complain of Teenage Booze Parties,” according to a headline in The Home Reporter. Beer, whiskey and wine-drinking vandals, who partake in nightly “orgies” at the huge set of concrete steps…on 76th St., are making life anything but pleasant for angered residents of the area. …”You name it and it goes on up on these steps and the plots of land on each side of it,” [said the owner of 7601 Colonial Road]. …A daylight inspection uncovered a total of 52 empty beer cans, three quart and fifth bottles of rye (empty, also!) and four drained pint bottles of wine decorating the plots on each side of the steps. 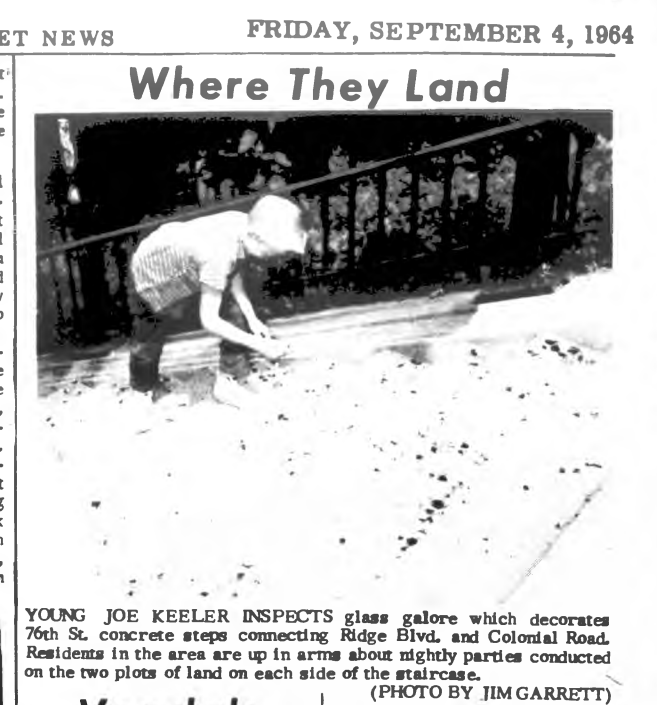 The concrete staircase…was littered with broken glass. …[a Home Reporter staffer] dropped down to the location that same night. And ‘lo and behold, a party was in progress. A group of about six teenagers who appeared to be in the 15–18 age bracket were enjoying a good supply of quart cans of beer and there was a distinct din of female voices to be heard. Making no attempt to keep the get-together quiet, the voices could be heard for a good distance, and many times the language was enough to singe the ears. Special thanks to Josephine Beckmann and Community Board 10 for sharing its files. 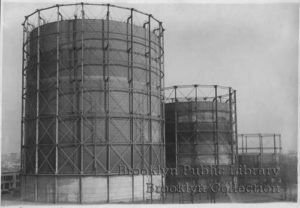 Interested in Bay Ridge history? Buy our book True Crime Bay Ridge from the Bookmark Shoppe or on Amazon.